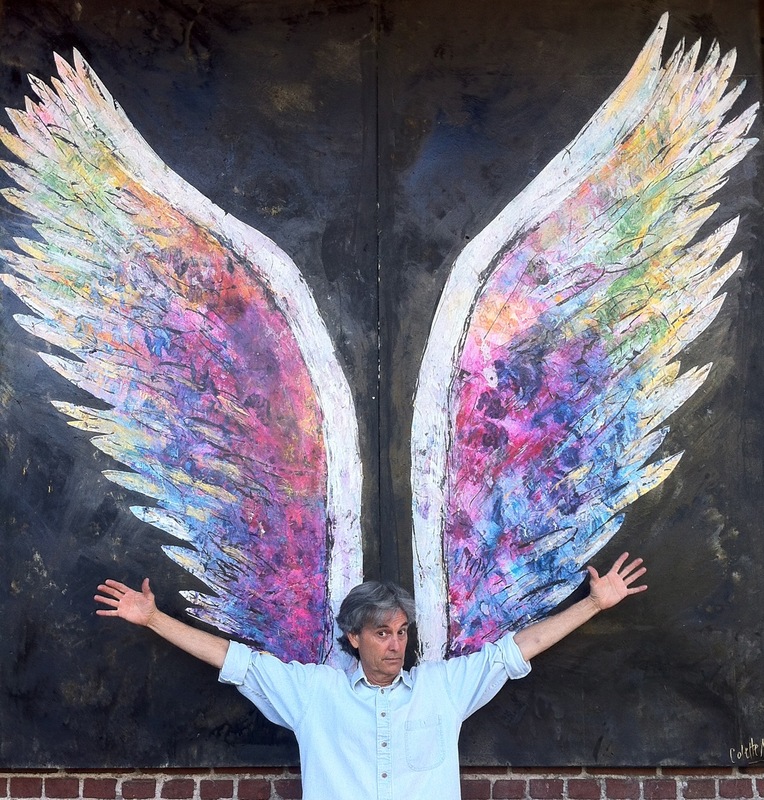 Before he moved to Downtown Los Angeles, artist and filmmaker Stephen Seemayer worked out of an abandoned ice skating rink on Ventura Boulevard. 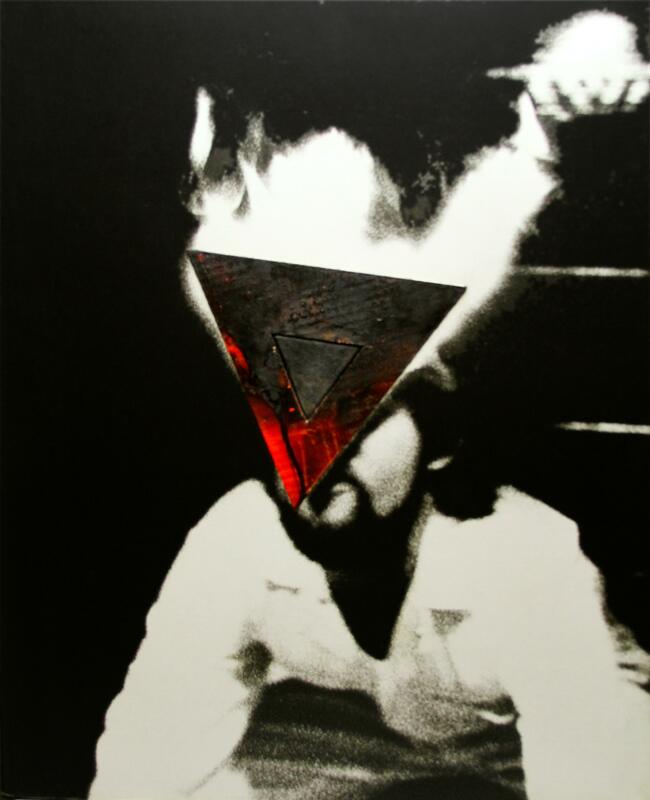 Seemayer, who was raised in the San Fernando Valley, is one of several artists featured in a new exhibit at Cal State Northridge’s Art & Design Center. “Valley Vista: Art in the San Fernando Valley ca. 1970-1990” is curated by Damon Willick and opens Mon., Aug. 25, 2014, with a public reception on Sat., Sept. 6, from 4-7 p.m. Highlighted by seminal works in painting, sculpture, photography and performance art, “Valley Vista” examines the unique contribution of the Valley to L.A.’s cultural history, and features work by many artists whose careers and lives took root in the Valley, including Hans Burkhardt, Karen Carson, Scott Grieger, Channa Horwitz, Gary Lloyd, Mike Mandel, Barry Markowitz, Michael C. McMillen, Stuart Rapeport, Jeffrey Vallance and Robert Williams, among others. 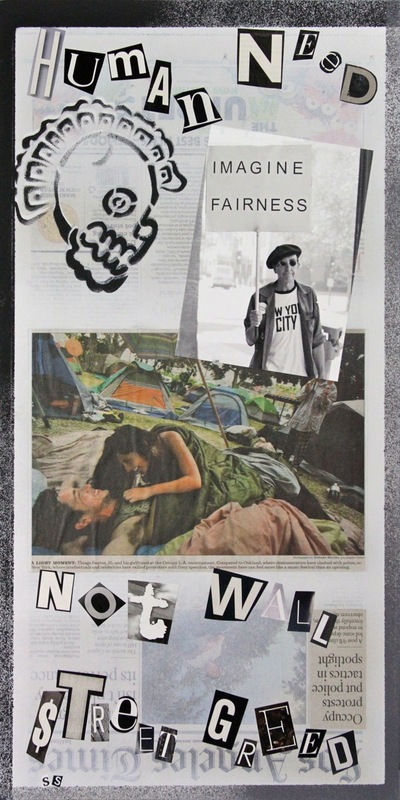 Stephen Seemayer’s exciting exhibition of 62 new works inspired by Occupy L.A. — now showing at the District Gallery in downtown Los Angeles — has been extended through Sunday, June 9, 2013. 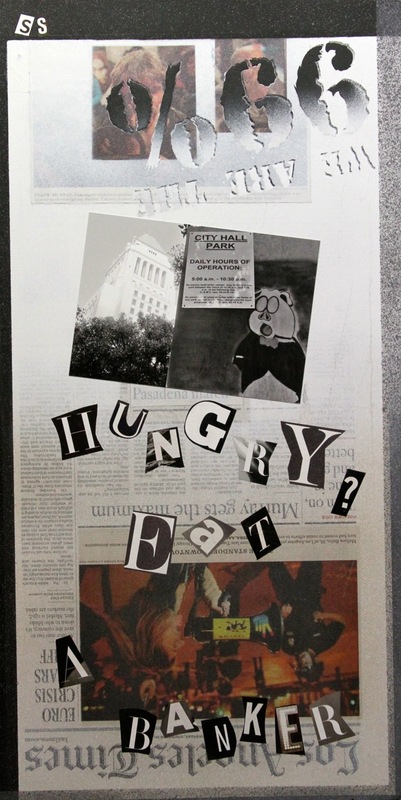 In addition to the collages, made up of reconstructed L.A. Times front pages, newspaper and magazine clippings, photographs and spray paint, the exhibit features a 5-minute movie about the occupation of City Hall in the fall of 2011. 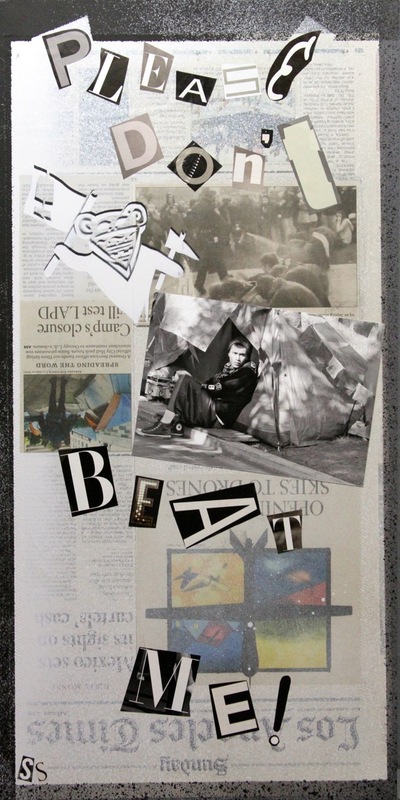 The film includes photographs and video that he and his wife, filmmaker Pamela Wilson, took over the two months of the protest, and from the last night, when the peaceful demonstrators were forcefully evicted by the LAPD. We are the change you want. Screw us and we multiply. 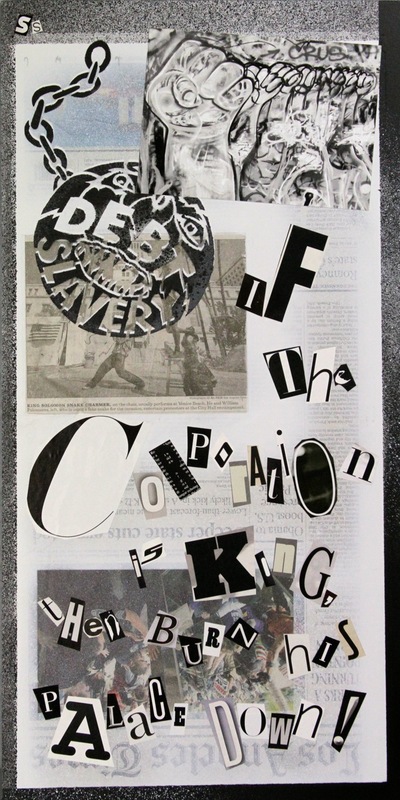 Seemayer’s collages incorporate the slogans and signage that got the occupiers’ messages across, along with photographs and stencils of revolutionary symbolism. Human need, not Wall Street greed. The love of people is the flower of all good. Spank the banks, pepper spray the Fed. Plutocracy, corporate welfare is killing America. I’m here now! It’s on! Occupy the world! The 99% will no longer remain silent. Banks, too big to fail, too big to jail. If the corporation is king, then burn his palace down. Some wars are waged with money, others with guns. America no longer riding riding on the merry-go-round.